The Aquarium's Education Department offers many different ways for kids to learn about marine animals—like penguins! In this special special guest post from Education programs coordinator Kara Mahoney Robinson, we learn about two penguin-themed programs available through the Aquarium's Education Department. We offer many programs for schools, including two very special programs about penguins—the Rockhopper Hop and the Penguin Program. Teachers and groups leaders often book these programs in the colder winter months when many schools are studying polar regions and the animals that live there. 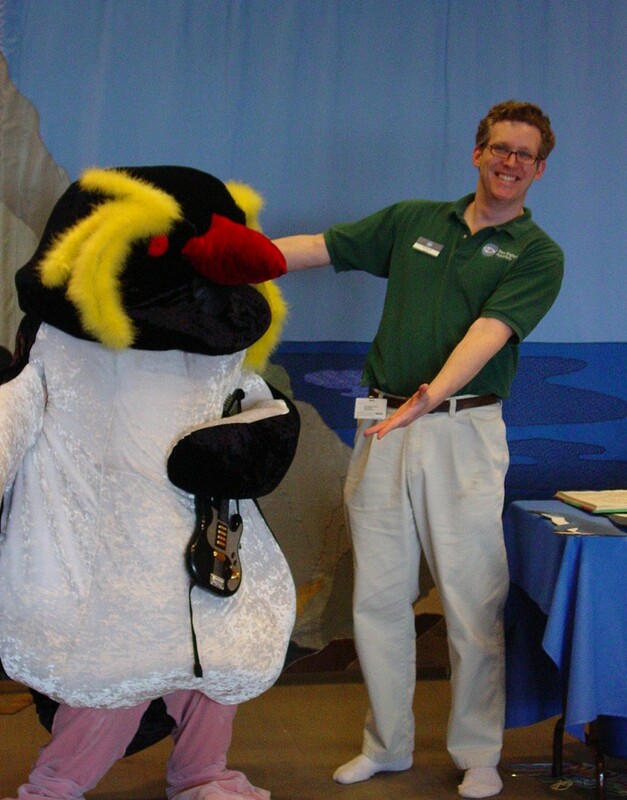 Both these programs are geared towards providing students with a fun interactive way to learn about penguins. The Rockhopper Hop is a high energy, assembly-style program that takes place at a school or community center. It is packed full of fun activities and penguin facts as students work to turn an Aquarium educator into a giant rockhopper penguin! Before the program, a kit is sent out to the school that contains books, activities and a mask-making activity. This program is most appropriate for grades K through 5 and can only take place at a school or community center as an outreach program. The Penguin Program is an engaging and interactive experience for students. Our Penguin Program focuses on penguin habitats throughout the world and also on their behaviors. During this program students learn both the penguin behaviors as well as how scientists gather data on these special birds. The fun comes when the students actually act out these two roles. Students love both acting like penguins as well as taking data on what behaviors their fellow "penguin" classmates are displaying. Together, the class graphs the data that the student "scientists" gathered. A final treat for the students is an up-close look at a taxidermied penguin! This program is most appropriate for grades 1 through 5 and can take place at a school, community center as an outreach program, or added on to an Aquarium visit as an Explorer Class. Students participate in a lesson about the four species of penguin found at the Aquarium (with the help of some adorable plush toys! )—African, little blue and northern and southern rockhopper penguins. If you are interested in any of the above programs please visit the Education department's website or email us with any questions.